I am not a big fan of Krishnamurti. He seems to be so convinced of his own ideas, that he gives me the feeling that there is no space for anything else than Krisnamurti. Of course, that is not what he says: his main topic is the infinite space that he experienced and that so many people in his audience sought in vain. I have listened to his lectures, read his books and watched his videos, and as far as I understand it, it seems all very true. But he doesn’t inspire me at all. In fact, he irritates me to no end: the tone of his voice, the sneers to his audience, the implicit self contentment, and even the repletion of certain expressions (like ”I don’t know if I am making myself clear…” )… It is definitely not my cup of tea. I cannot help thinking that he man was deeply disappointment in the people that came to listen to him. And maybe he even despised all humans. There have been several LP’s made of the lectures by Krishnamurti, but I never bought any. I have some of his lectures on tape, and that is enough. 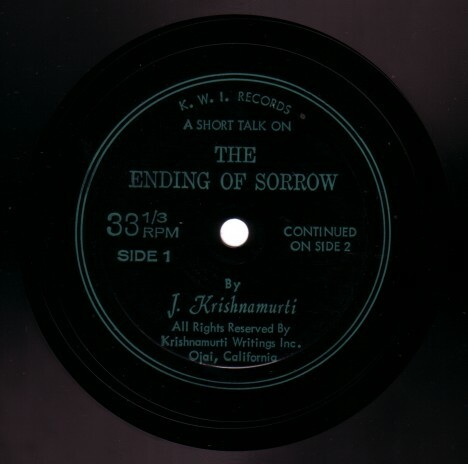 But today I found a cheap flexi record with a lecture on “The ending of sorrow” , that was released by K.W.I. Records . It is a great talk, and I fully agree with what the man says, as far as I understand it, but I find it hard to keep my attention to his words; my attention tends to drift to his tone.